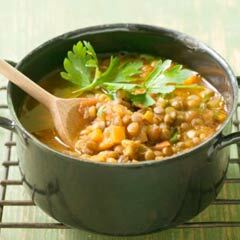 Place a 10- to 12- inch oven-safe skillet (or sauté pan!) on the stove over medium-high heat. Coat the bottom with olive oil. When the oil is hot, add the onions and a pinch of salt, and sauté until the onions are translucent and starting to turn brown. Add the potatoes and another pinch of salt, and cook, stirring every few minutes, until the potatoes are browned and cooked through. Add the red peppers and the thyme – I like the red peppers still crunchy, but cook them for longer if you like softer peppers. Taste to adjust the seasonings. Pour the eggs into the pan and stir the vegetables until the eggs are evenly distributed. 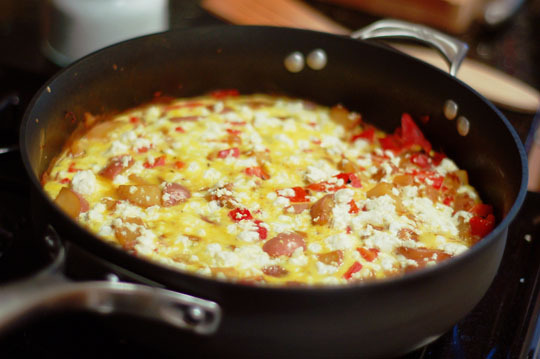 Sprinkle the feta over the top of the frittata. Cook without stirring for 3-5 minutes until the eggs are set on the bottoms and sides, but the middle is still runny. Put the entire pan in the oven and bake for 5 – 10 minutes until the eggs are completely set and beginning to pull away from the sides. Let the frittata cool for a few minutes and then slice it into wedges. We like to serve frittatas with a simple green salad and a crusty piece of bread.